At the 2016 Geneva Motor Show, Hyundai Motor is introducing the All-New Hyundai IONIQ line-up consisting of: IONIQ Hybrid, IONIQ Electric and IONIQ Plug-in. The world’s first model offering three electrified powertrains, IONIQ will make low- to zero-emission mobility accessible to everyone. The new approach of Hyundai Motor delivers an uncompromising design and driving experience through innovative technology and offers customers the latest connectivity and safety technologies. The IONIQ Hybrid and IONIQ Plug-in both feature the new Kappa 1.6 GDI, direct injection petrol, four-cylinder engine with a class-leading thermal efficiency of 40 percent, delivering 105 PS and 147 Nm of torque. The engine has been tailored to the hybrid application and is combined with the direct responding, smooth shifting six-speed double clutch transmission – differentiating the IONIQ from its competitors with a more dynamic driving experience. The mated electric motor enables pure electric driving and delivers instant torque as the chassis with rear multi-link suspension greatly enhancing driving dynamics. The IONIQ Hybrid’s electric motor delivers 32 kW (43.5 PS) with maximum torque of 170 Nm, powered by a lithium-ion-polymer battery with 1.56 kWh capacity positioned under the rear seats. In combination with the 1.6-GDI engine, IONIQ Hybrid offers a system output of 103.6 kW (141 PS) rpm and up to 265 Nm of torque accelerating to a top speed of up to 185 km/h with targeted CO2 emissions as low as 79 g/km or lower (combined). Drivers choosing the IONIQ Plug-in can safely rely on over 50 kilometres of estimated pure electric driving range powered by the potent 8.9 kWh lithium-ion polymer battery. The 45kW (61 PS) electric motor together with the 1.6 GDI four-cylinder Kappa engine offer targeted CO2 emissions as low as 32 g/km. The IONIQ Electric offers pure e-mobility through a 28 kWh lithium-ion polymer battery for an estimated maximum range of over 250 km. The instantly available maximum torque of 295 Nm is delivered by the electric motor with a maximum output of 88 kW (120 PS) through the single-speed reducer transmission accelerating the car up to 165 km/h. All versions feature the sleek aerodynamic silhouette with a class-leading Cd value of 0.24 that complements the soft lines and surfaces that trace the All-New IONIQ’s outline. A fluid exterior shape and natural air flow channels emphasize the aerodynamic body lines and volumes. These aims are met consistently throughout each of the IONIQ models – the IONIQ Hybrid, the IONIQ Plug-in and the IONIQ Electric. The joined-up development process influences the attractive styling of all versions as form and function combine seamlessly. Distinguished exterior design sets IONIQ apart from its competitors as the styling builds the car’s high-tech features into their design, emphasizing the efficiency of the whole range. In crafting the exterior appearance of IONIQ, Hyundai Motor’s designers concentrated on the car’s future-orientated character, which is at the heart of its appeal. A fluid exterior shape and natural air flow channels emphasize the aerodynamic body lines and volumes. A sporty, hatchback-like profile sets the IONIQ apart with the car’s distinguished exterior design contributing to its attractive styling. IONIQ’s sleek exterior shape is inspired by aerodynamic efficiency complementing the soft lines and surfaces that trace the car’s outline. Its exterior panels are designed to flex to boost aerodynamics further, which, when combined with various other smart efficiency solutions, produces class-leading Cd value of just 0.24. In addition to the IONIQ’s aerodynamics body shape, further design details distinguish the Hybrid, the Plug-in and the Electric versions from another creating their unique identity. The front of the IONIQ Hybrid is characterised by the Bi-xenon headlights that are embraced by the C-shaped LED positioning lamps. Hyundai Motor’s signature hexagonal grille and the vertical C-shaped LED daytime running lights further depict the purity of the car. Contrasting colours at the base of the bumper add an individual character while nine exterior colours are available and can be paired with a choice of two interior options. The colour choices for the exterior of IONIQ Hybrid and Plug-in are Phantom Black, Polar White and Platinum Silver along with Aurora Silver. Also available are Iron Grey, Marina Blue and Phoenix Orange as well as Mist Meadow and Chalky Brown. The interior colour choices are Lava Stone or Afternoon Breeze. The IONIQ Hybrid features specially-designed two-tone 15- or 17-inch wheels. Adopting most general exterior design details from the Hybrid, like the hexagonal grille and the vertical C-shaped LED daytime running lights, the IONIQ Plug-in will additionally feature low-beam LED headlamps. Depending on the exterior colour, an elegant blue or silver character line below the front and rear bumpers is a design feature both the IONIQ Hybrid and the IONIQ Plug-in have in common. For exterior colours Marina Blue and Phoenix Orange the accents will be carried out in silver. All other exterior colours feature the blue character line. These accents are also carried on fully through the interior of both models, for example with blue or white piping on the car seats. Naturally, the Plug-in, has an additional cap for the charging socket at the left front fender for charging the lithium-ion polymer battery that together with the 1.6 GDI engine sets the specially designed 16-inch wheels in motion. 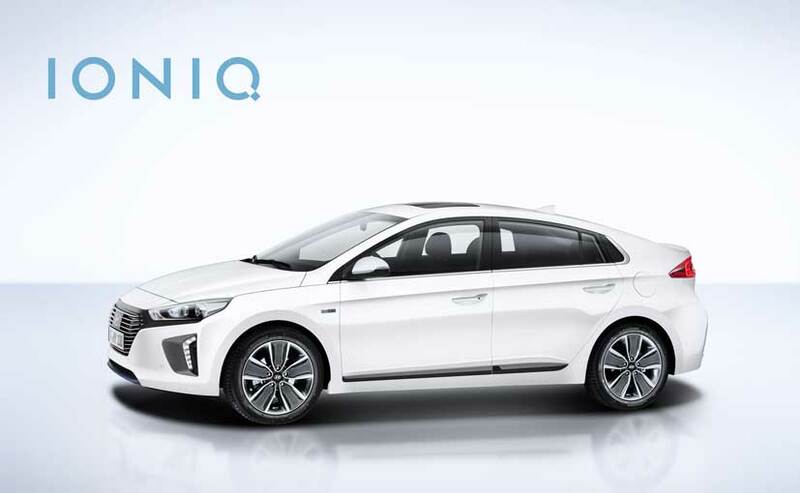 What instantly sets the IONIQ Electric apart is its front: without the motor’s need for cooling, the grille gives way to a clean and sleek surface in True Gray or Shine Gray – depending on the chosen exterior colour of the car. The line-up’s all-electric version also features low-beam LED front headlamps and rear combinations lamps with a unique pattern imparting a distinct identity to the car when looked at from behind. The electric character of the car’s design is underscored by the copper coloured character line below the rear bumper and below the front bumper, alluding to the property of copper as an excellent electric conductor. When Marina Blue, Phoenix Orange or Blazing Yellow is chosen as an exterior colour, these accents will be carried out in silver. Blazing Yellow is a colour option exclusively available for the IONIQ Electric, whereas Iron Gray, Mist Meadow and Chalky Brown can only be selected for the Hybrid and the Plug-in.